Published by Facing History and Ourselves as part of the civic dilemmas series, Stories of Identity reflects the way that migration affects personal identity and offers educators and students resources to examine this migration through methods of storytelling. It shares the experiences of immigrants in America and Europe from the individual to the collective through memoirs, journalistic accounts, and interviews. 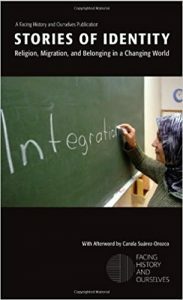 The book uses stories about family and upbringing, faith and doubt, religion, school and community, history and scholarship, interviews with young people and meditations from novelists and authors, including author Jhumpa Lahiri (The Namesake), Ed Husain (The Islamist), Eboo Patel (Founder of the Interfaith Youth Core), and many more. These experiences reflect a recent and global phenomenon where identity and citizenship are challenged by the greater blurring of national boundaries. Educator Spotlight: Teaching The Arrival What can we learn about the immigrant experience from food?